If you have never heard of an Indian head massage I am about to open you up to a new and exciting form of alternative medicine. I’ve never met anyone who didn’t enjoy or experience some positive benefits from having a head massage. So this is definitely something to add to your to-do list. Should I Have an Indian Head Massage? The techniques behind this form of head massage dates back hundreds of years. It encompasses the Indian belief system that the human body has a natural balance of energy flowing through different points. Through an Indian head massage this energy can be restored and the body can function a lot more optimally. Helping a person feel better physically, mentally, emotionally and spiritually. There are several techniques involved in the actual massage. The therapist uses their hands to gently massage the pressure points around the head, neck and shoulders. Stimulating blood flow and helping you regain focus and memory. With an increase of oxygen and blood flow to the brain comes a deep feeling of relaxation. If you’re stressed or under a lot of mental strain you will come out of a massage feeling a lot better. Our lymphatic systems are an important part of our body’s function in flushing out toxins. The stimulation from the massage increases the rate of the lymphatic system, speeding up the rate that we flush these toxins. This also improves the immune system, making us healthier and able to defend illness better. You are not going to grow a head of flowing locks if you’re bald, it’s not a miracle cure. But it some cases it does stimulate the follicles to start growing hair again. This is more of a side-effect than one of the reasons most people have head massages, but it’s a welcome benefit. Migraines can really affect the lives of some people who suffer from them. They are much worse than headaches. Often manifesting in incredible pain, dizziness, and cannot always be treated with painkillers. A gentle head massage can work wonders for some people. Completely relieving a migraine, and making future attacks less frequent and severe. The purpose of an Indian head massage is to realign the body’s natural energy balance. You will feel re-energized and full of energy afterwards and the effects can last for days. If you’re in need of recharging the batteries or a boost in energy, this is a perfect form of therapy. The deep level of relaxation you feel after a head massage can help you unwind when it’s time to sleep. The night of a massage is usually one of the best night’s sleep you will have had in a long time as your body adjusts. A typical head massage lasts around 30 minutes. You will have a brief consultation with your therapist before the treatment, giving you a chance to discuss any concerns you may have and informing them of any medical conditions. Most techniques involve using massage oils. You should advise the therapist of any skin conditions or allergies you have. Some oils or specific men’s shampoos can even help with certain conditions, so it’s always worth mentioning anything that may be relevant. If it’s your first time expect to have a strange or profound feeling afterwards. This is completely normal and it’s mostly due to your body releasing toxins and the extra blood circulation. 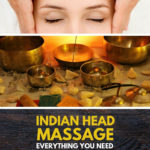 If you are free from any medical conditions an Indian head massage can benefit you in many ways as discussed above. It’s great for giving a person an overall better feeling of well being and more energy. Another selling point is that there isn’t much preparation involved. Once you have the all clear you can pop in for a 30 minute session or less whenever you have the time. Ideally you will be combining it with some relaxation time. But if you can do is grab 30 minutes on a lunch break then go for it. Whatever it takes and whenever you can make time for a head massage I recommend you do. You will feel a lot better for it. This was a guest post from Jessica Fuller. She has a passion for massage, alternative therapies and blogging and combines everything over at foryourmassageneeds.com.